Him kill both friar and priest – O dear! In 1655, Spain was the greatest naval and military power on earth, and controlled the sea lanes of Central America and the Caribbean. 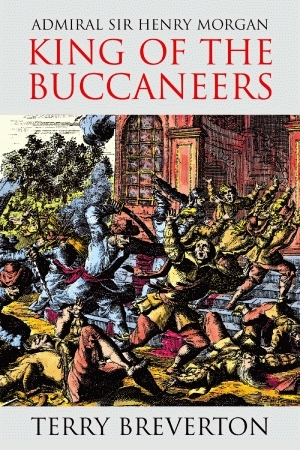 Henry Morgan’s career as a buccaneer officially began when, at age twenty, he landed in Barbados as part of a force deployed to capture Cuba or Hispaniola (Puerto Rico) for the British. The deployment failed, but the forces did capture Jamaica, which would become Morgan’s adopted home base for the rest of his life. From there, Morgan planned the attacks that would enrich the British throne and usher in the era of British supremacy on the high seas. For his leadership in battle and as lieutenant governor of Jamaica, Admiral Sir Henry Morgan deserves to take his place alongside Sir Francis Drake and the Duke of Wellington in the panoply of history’s greatest heroes. Terry Breverton is an expert on Welsh history and is the author of fourteen books including Black Bart Roberts: The Greatest Pirate of Them All and The Pirate Dictionary. Mr. Breverton is a recipient of the Helm Fellowship at the University of Indiana. He lives in Wales and is a senior lecturer in marketing and management at UWIC Business School in Cardiff.